Collective meltdowns are seldom pretty. Yesterday’s was one of the worst I’ve seen. Palmeiras weren’t even a shadow of the team that bravely stood up against all and everything last Sunday; Coritiba simply walked all over our men and crushed their spirit in a matter of minutes. It was sad. Personally, it hurt me the most to watch São Marcos: he looked tired, old, out of synch, out of energy. I make Conrado Cacace’s words my own: I fear we might have seen the last of him. It’s almost surreal: 6 days ago – and featuring the best defence in the country – Palmeiras was the team to beat and considered a strong candidate to lift both the Paulistão and the Copa do Brasil trophies. Nothing of that remains. In the coming days and weeks, the task is to gather the pieces and see what can be saved. Who to blame I don’t know, but I do know that anyone who presents a simple answer and/or solution is dead wrong. However, it’s best to be prepared for rough times; this is Palmeiras, where visible political powerplays and personal interests only form the tip of the iceberg. People reacted differently to yesterdays 6-0, with everything from the silent and resigned shake of the head to the spraying of protests on the walls of the Palestra. Many want to see the rolling of heads, but who’s? Director of football Roberto Frizzo and coach Luiz Felipe Scolari are obvious targets, in addition to several of the players that hit bottom the hardest yesterday (I don’t believe in hanging out individual players in a moment like this; watch the game recap and make up your own mind). Again: fear the worst as rationality and seeking what’s best for Palmeiras might go out the window when individuals scramble to save their own skin and, if possible, advance their petty ambitions for power, perks and kickbacks. From the bottom of my heart: please God prove me wrong. Literally, Salve o Palestra. Next Tirone: sign the damn thing! Last night’s match was a shame, a lack of consideration with Palmeiras supporters. I totally understand your frustration, Mika… And especially if you were one of those who travelled all the way to Curitiba to watch the game from the stands. Comentei na derrota que tivemos contra Corinthians… hoje nao ha muito que falar. Lá se vai mais uma Copa… faz anos que nao vejo o Palmeiras ganhar alguma competicao importante, desde a Libertadores de 99; bons jogos sim, mais campeao que é melhor, nada! Pois é, Renato. Os desafios estão lá, continuam lá… Se não mudar a política do clube e tirar os elementos que jogam contra, o meu receio é que vai continuar assim. Mas sinceramente: acredito em mudanças. E assim que a Nova Arena ficar pronta… Nada segura o Verdão! Your words say everything. It might be one of the biggest frustrations for us on this millennium. It was really sad looking at the players. Thanks for your feedback, felkis. Let’s hope that we “meet” here in the comments space at some other, more pleasant opportunity. Cheers! I also hope that by the time our new Arena is finally done, a new Palmeiras will rise. Until that time, however, I fear we’ll still agonize. Who knows, Guilherme…. Perhaps the time is ripe for change. New associates, willing to go the extra mile, voting out the old and paving way for fresh blood. Let’s keep the hope up! I just can’t believe that this ridiculous show has happened by accident. Just because the players were very tired, or because we have a bad team. I just can’t believe it’s that simple. Something more happened behind the scenes. I don’t know if it’s because I can’t stand this defeat and I’m trying to find some reasonable explanation, but I can’t even think about losing like this just because the other team is 6 times better than mine. And this game was specially painful because I thought something like “why do I still want to watch it? Why do I still believes in it?” you know? And this is something nasty for a soccer lover, for a Palmeiras lover. Well, I’d better think what I use to when this happens… This game was shameful, this whole situation now is shameful. 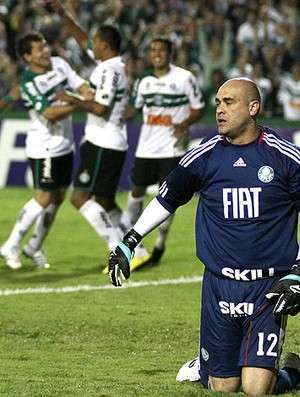 But I can’t forget this is Palmeiras and there’s nothing shameful about it at all. And Kristian, as always, you just say everything man… My sincerely regards. Man, your comments go straight to the heart of things, not least the important difference between feeling ashamed of a situation and, as some careless individuals put it, ashamed of Palmeiras or of being palmeirenses. That must NEVER happen. Always united, always believing, always Verdão na veia. Primeira vez que comento aqui, já acompanho a algum tempo esse blog. Primeiro, parabenizo o espaço aqui para a lingua inglesa, uma iniciativa que poucos clubes brasileiros tem – acredito que só tem esse pra ser sincero. Essa derrota foi a coisa mais humilhante pra um time que tem uma história honesta. Não porque perdeu de 6×0, mas do jeito que perdeu: sem garra, sem vontade. Nenhum palestrino merecia ver seu time ser humilhado e ver que seus jogadores, representantes, não deram a minima. Volte sempre e Avanti Palestra!